Visualize beautiful and functional surroundings created by you. Whether searching for new career skills or knowledge for personal use, this program is certain to provide the solutions. Learn the foundations of design through lectures, problem-solving projects, and field trips. Take the complete five course series or take just one course. Professionals will show you how to make the best decorating decisions for your home, friends, or clients. Learn the essentials regarding color, design elements and design principles. Also, you will explore design history, fabric and interior materials, window treatments, and business practices. From an architectural perspective, acquire an understanding of lighting, basic drawing and drafting, and reading blue prints. Assistant to building professionals including interior designer, contractor, or architect in the implementation of interior designs. Sales representative or employee for wallpaper, paint, carpet, lighting, furniture, or fabric stores; office furnishings and space planning suppliers; architectural offices, etc. Course materials: The Interior Design program may require additional fees for textbooks, and supplies. 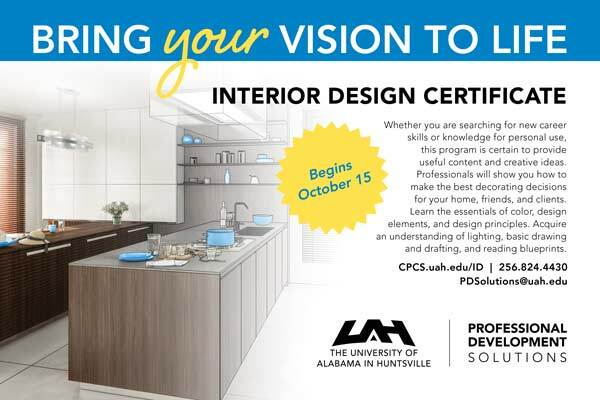 Please Note: This program is not preparatory for the NCIDQ exam, nor does it provide individuals with the credentials to be identified as a Registered Interior Designer, a title awarded only by the Alabama State Board of Interior Design.